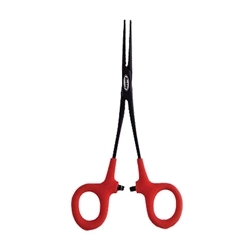 The Berkley 6" Hemostat Pliers are a must for every angler to keep in their tackle box. The slim line needle nose fits into the tightest spots and have a textured jaw for better grip. Features a stainless steel construction for corrosion resistance. These pliers have a self-locking design perfect for removing hooks or tying flys and have a comfort non-slip grips that keep pliers steady.